Confused about buying barley in bulk? Do you know the difference between hulled and unhulled? This post will answer your questions about the different types of barley, how to use them, and plenty of recipes for barley-lovers. Whole Unhulled Barley: The tough inedible outer hull is intact. Uses: Sprouting, Beer making. Not for cooking. Whole Hulled Barley: The tough inedible outer hull has been removed. Whole Hulled Barley undergoes minimum processing so that the bran isn’t lost. Uses: Cooking. Cooking time is longer than Pearled Barley. More nutritions than the pearled variety. Soak the grains before cooking to cut down on cooking time. See Rita Romano’s book Dining In The Raw for soaking times. Pearled Barley: Not considered a whole grain. After the hull is removed, the barley is polished to remove some or all of the bran. The more pearling, the whiter the color. Barley purchased in the supermarket is usually the pearled variety. Uses: Cooking. Cooks faster then Whole Hulled Barley. Not as nutritious as Whole Hulled Barley. WholeGrainsCouncil.org is a website chock full of information about barley, and all types of grains. Read more about barley here. Photographs of barley here. Barley is a great winter grain. Add it to soups and stews. See lots more recipes at Barley Foods.org. 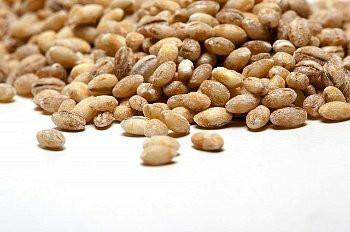 Posted on February 7, 2013, in Food and tagged Barley, barley recipes, hulled barley, whole grains. Bookmark the permalink. Leave a comment.